Very professional on all levels. Delivered exactly what was chosen and everything was explained fully. I was very pleased! My new liner was installed as planned, no problems! My mother had a new in ground pool liner installed in the spring of 2012. J&J Services were very nice people to deal with. The liner turned out beautiful. 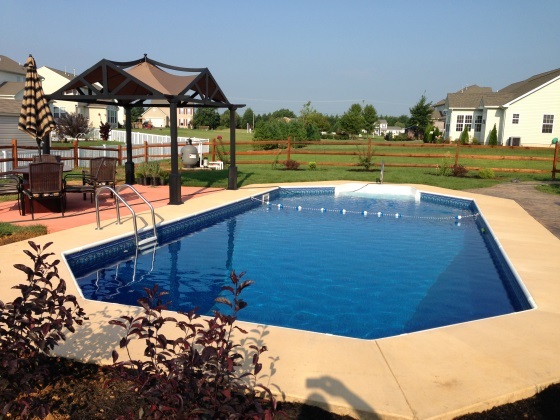 The company came highly recommended by Dover Pools in Seaford, DE. I would rate their overall level of service as excellent. Did what they said they were going to do at the price they quoted, and had the job done on time. The management always returned calls and kept us informed why any changes needed to be made. Always made workers available if needed. The men were hard workers and seem to do work without being told what to do. He knows the business. He finds the problems and fixes them. He has done 2 jobs for me. He does what he says and does it in a timely matter. I think he is great. A reasonable time frame. I trust him completely. Already referred to 2 people. Everyone was very professional, friendly, and knowledgeable about the job. It was done quickly. The new liner was put in after removing the old one, and they refilled the water. They arrived when scheduled and were done in about 4 hours. They followed up to check on the job. Very satisfied with the company. Pool was ready and looked beautiful before deadline! The owner was a very nice person , he was so helpful. He was trustworthy. All the workers was so nice. Everyone did a good job. That year it rain a lot. They would call and tell us if they couldn't come or if something came up. I tell people if they need pool repair to call you. Thanks a lot! They did a great job, on time, and great price.